Baked beans are a classic summer dish to take to picnics, barbeques, and potluck dinners. So I was excited when I found a hundred-year-old recipe for Baked Beans. It takes a long time to make Baked Beans the traditional way. They need to be soaked overnight and then cooked for many hours. I thought about possible shortcuts (using canned beans or cooking the beans in a pressure cooker), but I decided that it would be more authentic to follow the directions in the old recipe. So the final verdict is that they aren’t quite like modern Baked Beans, but they’re good. Posted on August 27, 2017 August 26, 2017 by SherylPosted in FoodTagged beans, recipe. Lovely recipe. I have a good one that is vegetarian and uses miso. Your recipe also sounds good. I never would have thought of putting miso in baked beans. It’s a nice old-time recipe. I love baked beans – this looks like a good recipe! If you like baked beans without the thick sauce you’d like these beans. I remember when I first made a recipe something like this when I was just married. I slaved away all afternoon, and was so disappointed to bring to table – a casserole of baked beans! Your comment made me smile. I can definitely relate it. Baked beans take a long time to make (though much of the time they are just cooking and there’s no active prep) – yet you don’t end up with a showy dish. The original recipe has an interesting cooking technique, with the draining of the first boil and using cold water again. I’m wondering now if that didn’t make the beans softer more quickly. I also wondered about why the water is drained. I thought that perhaps it was to remove some of the starch from the beans. I actually wondered why the recipe stated “cold water”. I’ve seen other bean recipes where boiling water is put on the beans for the soaking process (or sometimes they are brought to a boil before soaking). helps for those who have intestinal issues with bean dishes. We always drain the soaking water and I don’t know anyone that wouldn’t. I never follow anyone’s recipe where I see they don’t as I figure they just don’t know what they are talking about, so how would I trust the recipe. Like for example…just throw it all in a crockpot and cook for 7 hours etc. We never used bacon, we use salt pork chunks. Baked beans should not be runny and goopy like the stuff out of a can. My standard recipe is from my maternal grandma who was from Boston and she cooked hers in a beanpot. They are not sugar sweet but have a good molasses taste. Since there are only 3 of us left at home I often freeze the leftovers in 1 cup containers for easy additions to a meal. I agree – baked beans shouldn’t be runny and goopy. The beans in a can are a poor imitation of the real thing. Thanks for the explanation of why the water should be drained after the beans are soaked. I probably should have known this, but somehow didn’t (or at least didn’t remember it). It’s fascinating how many things can affect how a recipe turns out. I guess it’s what makes cooking such a fun adventure. I have a lot of fun trying the old recipes. I’m not sure how many cooking secrets I’ve learned, but it’s interesting how cooking processes and procedures sometimes have changed across the years. Your beans look like my Moms ! Love those memories 🙂 I make bake beans ,I use my own canned beans instead of soaking them overnight then cooking. The canned beans are not so dry then. Like you, when I make the baked bean recipe that I usually make, I use canned beans. It really shortens the cooking time; and, at least for me, makes the final result more predictable. I’m impressed that you can your own beans. Canning beans isn’t hard , but you do need to know how to use a pressure canner. These remind me of the delicious ones my mother made. They were not real saucy and I still prefer beans that way. I’m going to get out my bean pot and try this when the weather turns cool! Thank you! It’s nice to hear that this post brought back some good food memories. If you like beans that aren’t very saucy, I think that you’ll like this recipe. This is about how my dad makes his. He uses both molasses and brown sugar. mmm. . . I like the idea of using both molasses and brown sugar. I have never cared for baked beans, but this gave a whole new slant on it. Looking up a bit of research (i.e. “pea beans”) led to a new trail. Turns out pea beans were renamed ‘navy beans’ due to discovery of high protein and filling ability so they were standard fare for sailors. That led to Senate Bean Soup, and some fun in the newspaper archives attempting to answer a question that apparently has no answer. I learned something new. The story behind navy beans is fascinating. Thanks for researching this. I love baked beans, but these clearly are different from the ones I grew up with. They were saucier and had more bacon, which was chopped up and mixed with the beans. Then, more brown sugar was sprinkled on top. But I’m not averse to a new recipe, and this will be a good one once autumn arrives, and it’s not a hundred degrees! The baked beans you describe are much closer to the baked beans that I grew up with, too – though I think that we also put ketchup in them. Thinking of you, and hope that things are okay. The storm looks terrible on the news. Yes! We did add ketchup, and a lot of finely chopped onion. They were delicious. The flood isn’t delicious. It is just terrible, and it’s getting worse. The river flooding is going to be hitting records, too. At this point, everyone is a little grim and stunned, but there are amazing reports of rescues, and our agency leaders are doing spectacular work. Whew, it sounds awful. They’ve shown a few of the rescues on the national media. It’s good to hear that agency leaders are doing such a good job during this difficult time. Take care and stay safe. 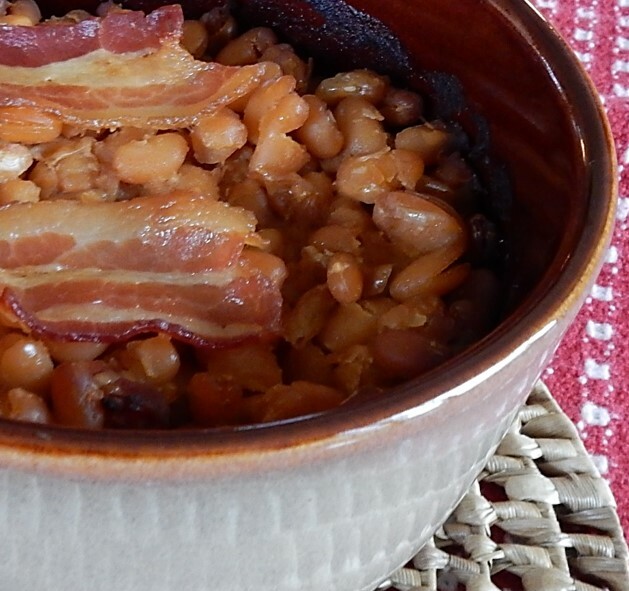 My Vermont Gram made baked beans with soldier beans, salt pork and maple syrup. She soaked the beans overnight and cooked them for hours, restoring the water level with boiling water when it got too low. The finished product was not very saucy but I recall they were delicious. mmm. . . It sounds wonderful. I never thought about using maple syrup in baked beans. I may have to try this one – different from my aunt Marty’s. Which I simplified the past few years. I buy Bush’s Baked Beans (1 can of bbq and 1 can of original and 1 small can of onion flavor) add corn syrup to thicken and crumbled bacon. I also drain the can of original to make it thicken better. Bake until thick and wala homemade baked beans without the fuss. 🙂 In my old age I try to simplify my recipes. Never thought to use tomatoes though, your recipe sound really tasty. I’m with you – simple and easy-to-make recipes are the best. One note about the recipe I posted — The baked beans had very little tomato taste. The recipe only called for 2 tablespoons of tomatoes -which really isn’t very much. I think that more would need to added to get much of a tomato flavor. I will try it the way it is first – sounds yummy. Waiting for it to get a bit cooler though. So far though its been a nice late summer with cool evenings and even had to dig out some long sleeves shirts. 😀 Can’t wait for the chill in the air that fall brings! How is your weather? They do look very different from modern baked beans. It’s interesting to my how recipes change over time in a widespread way like this. I also find it really fascinating how much some recipes have changed across the years (as well as how little some other recipes have changed). Sometimes I can come up with a possible reason for the evolving recipes, but other times I have no idea why they might have changed. I just ran into your blog today. Apparently we think alike as far as vintage recipes although mine aren’t quite as old as yours. Baked beans are one of those things that aren’t hard to make, there are a million recipes out there, but some of them are just not as satisfying as others. There was a woman at our church who made the best baked beans. I think that recipe might be lost to time, but I’ve been able to cobble together something that was similar. I visited your blog. It was fun to see the old recipes that you’ve made. I agree that there are many ways to make baked beans – and that some recipes are tastier than others. I love the bean recipes that are thick and molasses-y best. Molasses adds a wonderful rich, nuanced flavor to baked beans.